Colder temperatures and the approaching holidays mean pie season is here! Served a la mode, at the end of a big holiday meal, or even for breakfast (we won’t judge), there’s no wrong way or time to enjoy a slice of pie. Check out our list of some of our favorite Atlanta pie places! Buttermilk Sky– We’re partial to their Buttermilk and I40 flavors, but their seasonal pumpkin is not to be missed! Sugar Shack– With fruity flavors (like apple, blueberry, or cherry) or the classic Thanksgiving staple, pecan, there’s something for everyone at this Brookhaven favorite! Alpine Bakery– This spot is convenient for those OTP, with two locations to choose from (Woodstock and Crabapple). 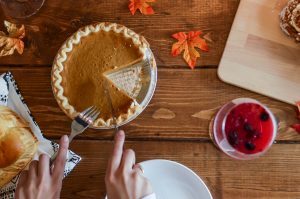 Pie Bar– Order your Thanksgiving pie until November 16 at this downtown Woodstock spot! Seasonal favorites include cranberry orange buttermilk and bourbon chocolate pecan.